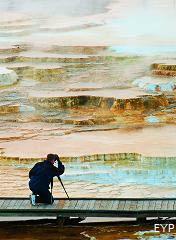 Mammoth Hot Spring Terrace in Yellowstone National Park. 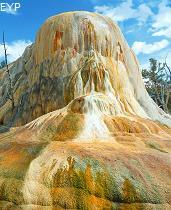 Mammoth Hot Springs in Yellowstone National Park is just 5 miles south of the North Entrance at Gardiner Montana. 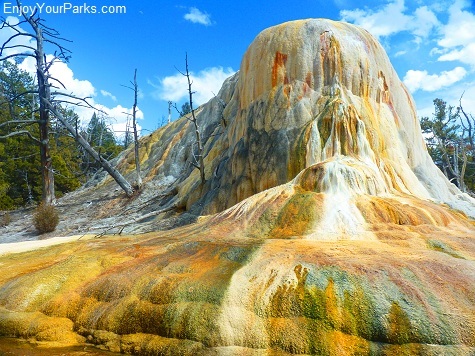 Its main attraction is the incredible Mammoth Hot Springs, but there are many other features and attractions that make Mammoth a very special and popular place for vacationers to visit while touring Yellowstone National Park. 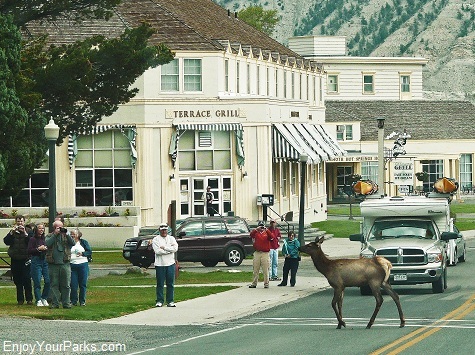 This is "Classic Mammoth Hot Springs" with an elk crossing the street in the middle of town! 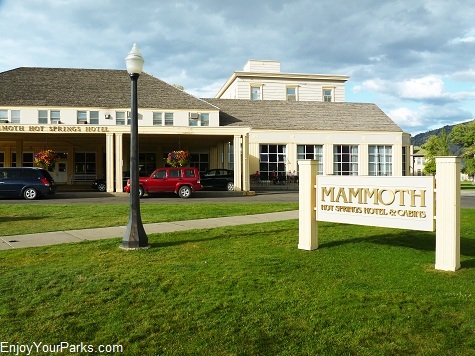 Mammoth is the Yellowstone Park Headquarters, so there is basically a small town here. 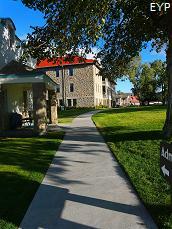 Visitors enjoy eating at the restaurant, or staying at the famous Mammoth Hot Springs Hotel. 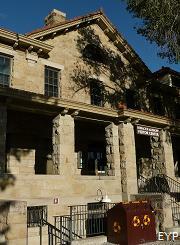 There is also a visitor center and general store that travelers enjoy. 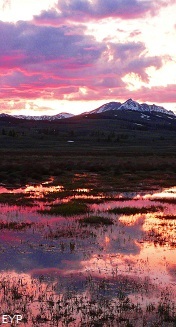 The Mammoth Campground is open all year long, and is a popular place to camp. 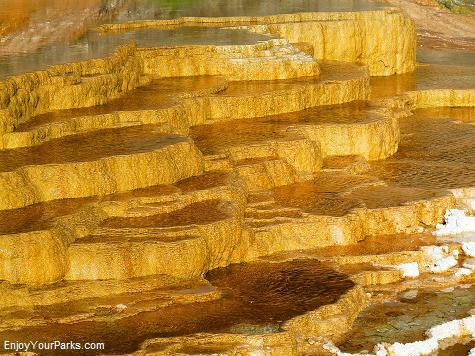 The main attraction however is the amazing Mammoth Hot Springs Terraces. 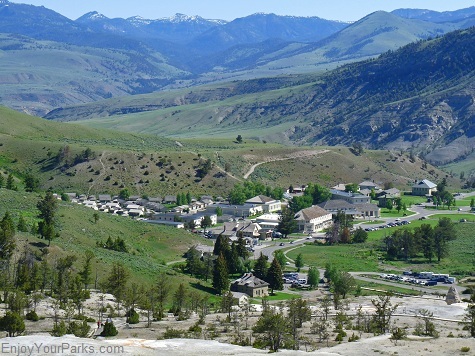 The Mammoth Hot Springs Hotel is an historic icon of Yellowstone National Park and is a very popular place for visitors to stay while vacationing in Yellowstone. 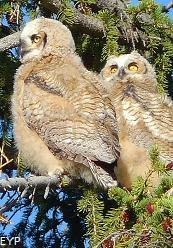 This photo was taken in the Mammoth Campground. 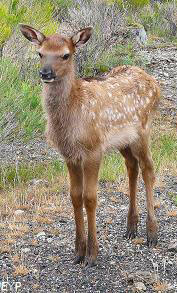 Cow elk often give birth to their calves right in the Mammoth Campground to try to protect them from predators. 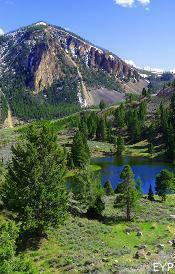 Mammoth Campground is one of the most popular Yellowstone National Park campgrounds. 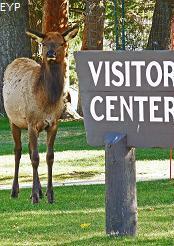 Not only is it in an ideal location for visitors who want to explore the northern section of Yellowstone Park, but it is the only Yellowstone Park campground that is open all year long. 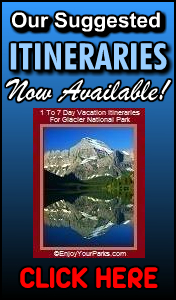 Therefore, it is extremely popular for those folks who are visiting Yellowstone during the non-summer seasons. 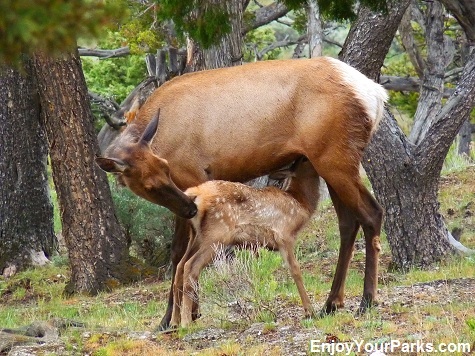 And one thing that you'll notice about this campground is that during the spring of the year, cow elk actually come into the campground and give birth to their calves! 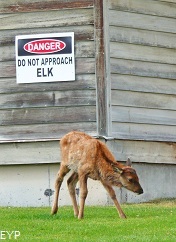 This is to avoid predators that frequent the area. 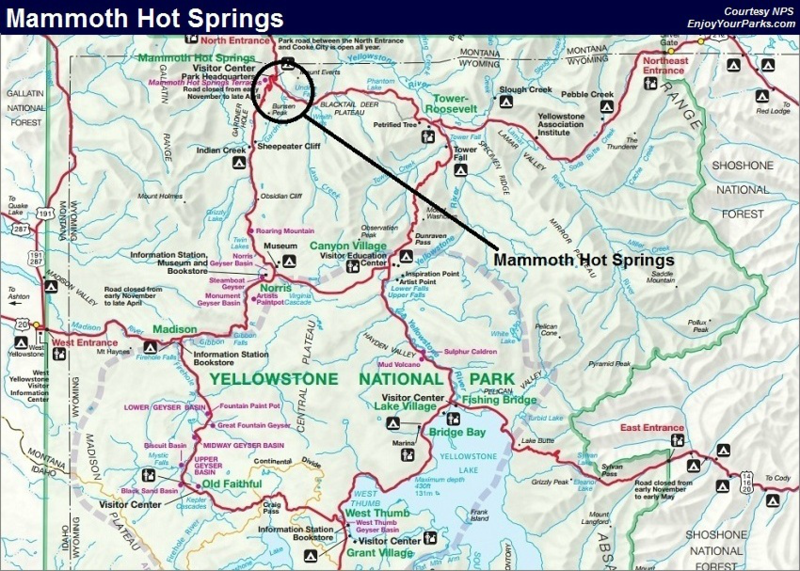 For more information on the Mammoth Campground, click here. 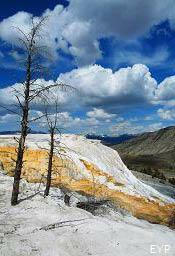 The town of Mammoth Hot Springs in Yellowstone National Park is nestled in some amazing scenery. 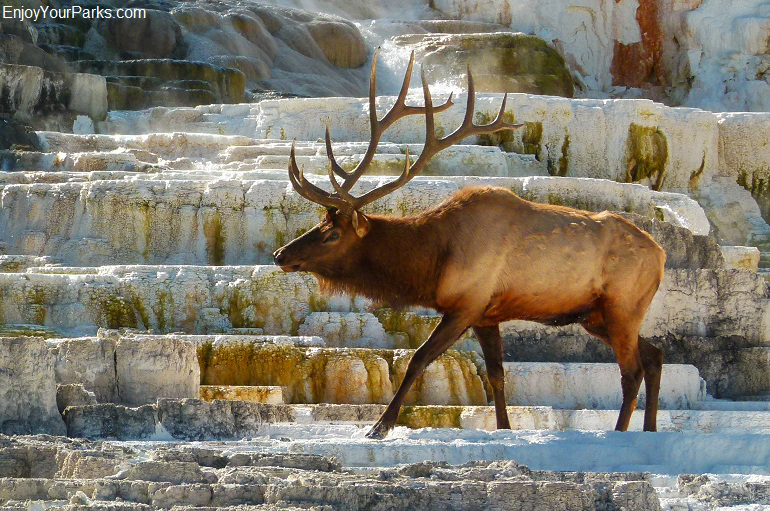 Besides the amazing Mammoth Hot Springs, there is another really incredible feature of Mammoth, and that's the elk. 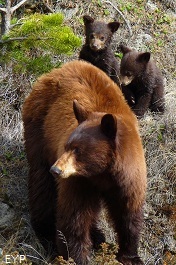 There is a resident herd that hangs out all year long, so Mammoth is a great place to see them. bulls fighting for a harem right in the middle of town! It's really an amazing sight to see! 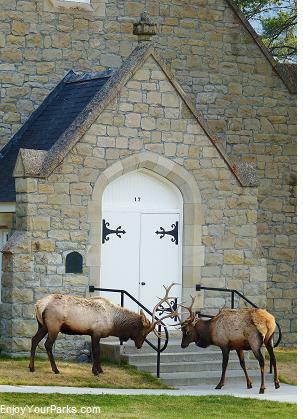 The photo to the left is of two young bull elk sparring outside the Mammoth Church! 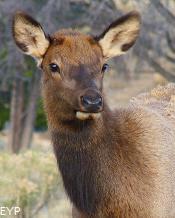 During the fall mating season, known as "the rut", huge bull elk bugle at the top of their lungs. 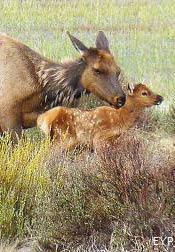 This is a very common occurrence at Mammoth and is a thrill to see and hear. 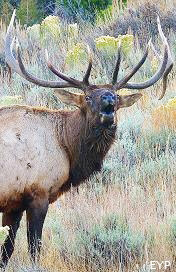 The Most Famous Elk In Yellowstone: "Elk #6"
right photo). 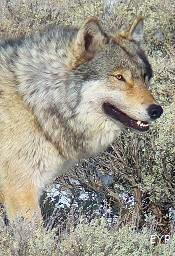 His fame came from is "crazy" temper during the fall mating season. 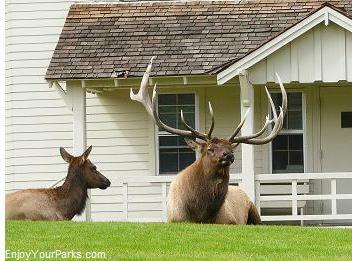 He would get so "fired up" that he would attack cars with his huge antlers, as well as chase visitors down the street! Several times the rangers would have to cut off his horns so he wouldn't be so dangerous, but of course the next year the horns would grow back and he'd once again terrorize Mammoth. He is greatly missed by all that came to know him. 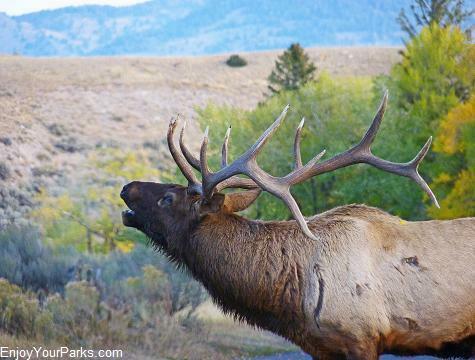 He was a living legend of Yellowstone National Park. 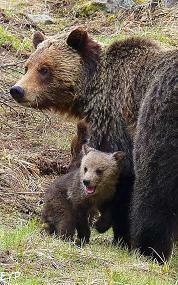 Hopefully one of his many offspring will take his place and once again "terrorize" the town of Mammoth! 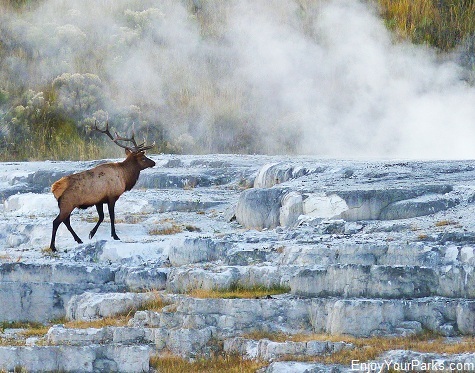 "Elk Watching" takes on a whole new meaning at Mammoth Hot Springs in Yellowstone National Park. 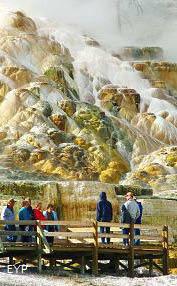 Only in Mammoth Hot Springs! 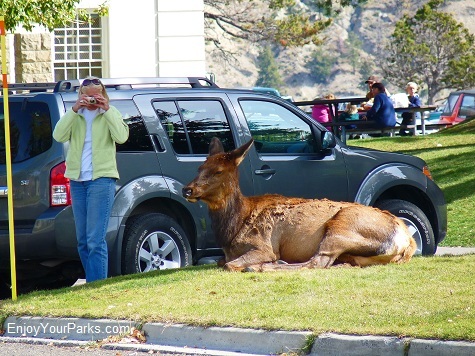 Sometimes the Mammoth Hot Springs Terraces in Yellowstone National Park have interesting guests! 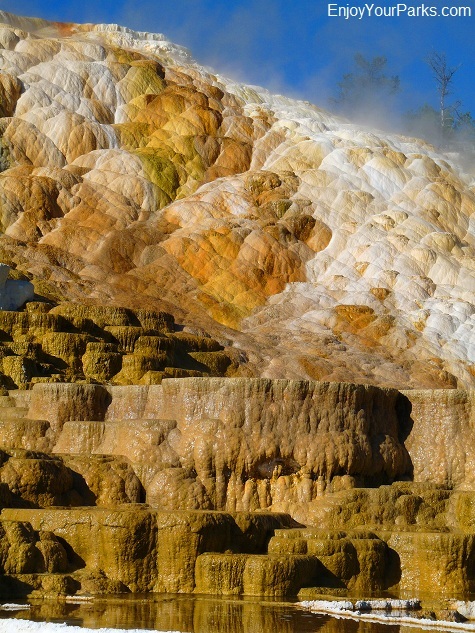 The famous Mammoth Hot Springs Terraces in Yellowstone National Park is always a favorite for visitors exploring the Mammoth Area. 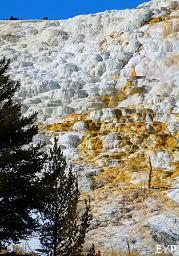 The Upper Mammoth Hot Springs Terrace of Yellowstone National Park has some really unique hydrothermal structures. 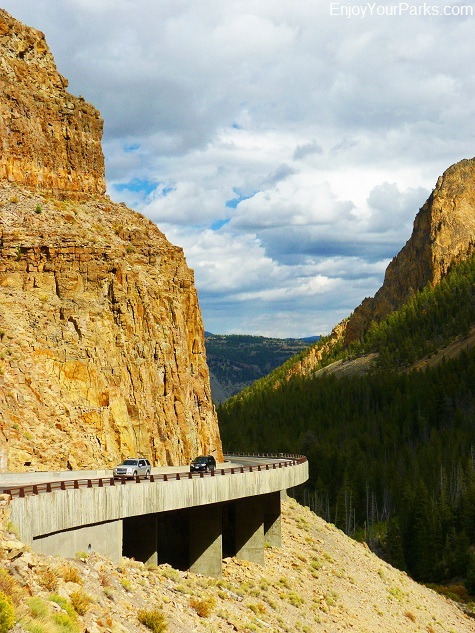 Golden Gate of Yellowstone National Park. 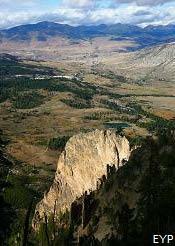 The Golden Gate of Yellowstone National Park is located just a few miles south of Mammoth Hot Springs, just up the hill from the Upper Terraces. 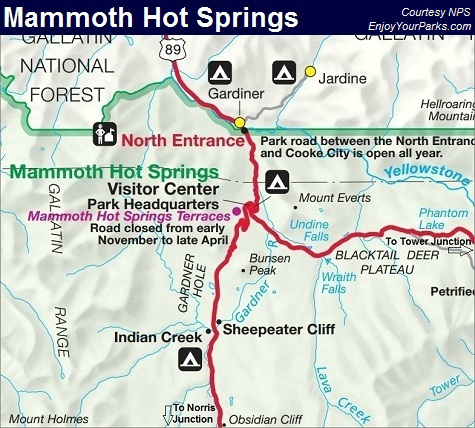 The road takes you up to Swan Lake Flats and then southward to Norris Junction. 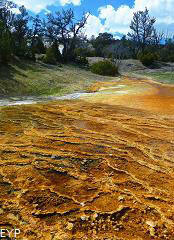 This is a very famous iconic image of Yellowstone Park. 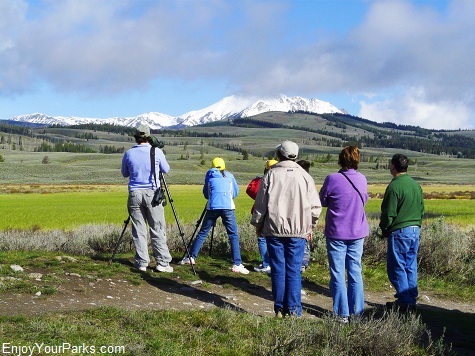 Wildlife watchers enjoying a distant grizzly bear on Swan Lake Flatin Yellowstone National Park. 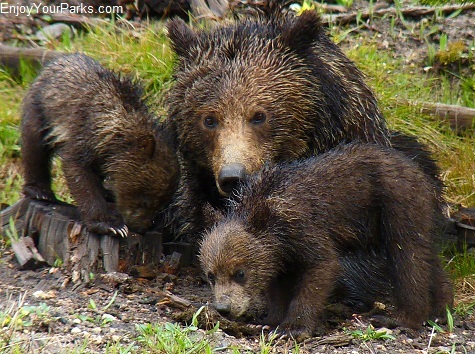 Swan Lake Flat is a vast, open area that is a great place to watch all kinds of wildlife, including grizzly bears, black bears, gray wolves, buffalo, elk, birds and much more. 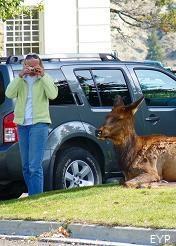 This is an extremely popular place for animal watchers and photographers. 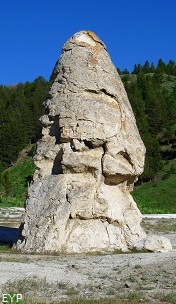 This area is located south of Mammoth Hot Springs, just beyond the Golden Gate along the road heading for Norris Junction on the Grand Loop. 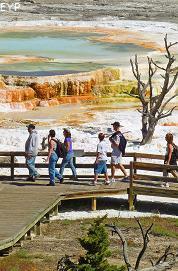 Mammoth Hot Springs is an important part of planning a Yellowstone Park Winter Vacation. 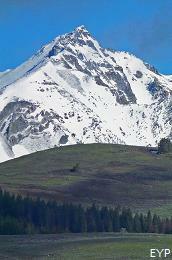 For more info on Winter in Yellowstone, click here. 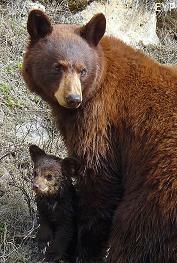 Grizzly bears love to hang around Swan Lake Flats in Yellowstone National Park. 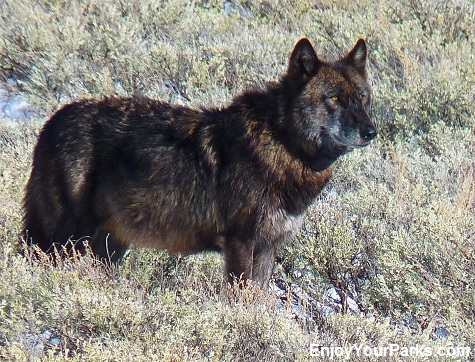 You may also get to see a gray wolf on Swan Lake Flats if you're at the right place at the right time. 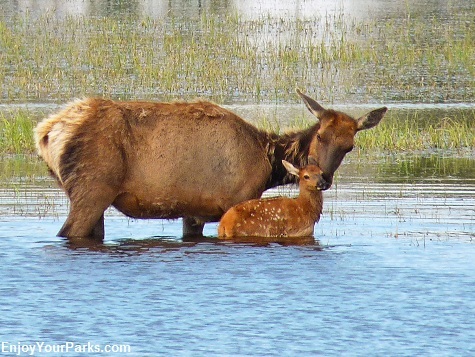 This cow and calf elk decided to take a swim in Swan Lake. We were lucky to be there to witness it. 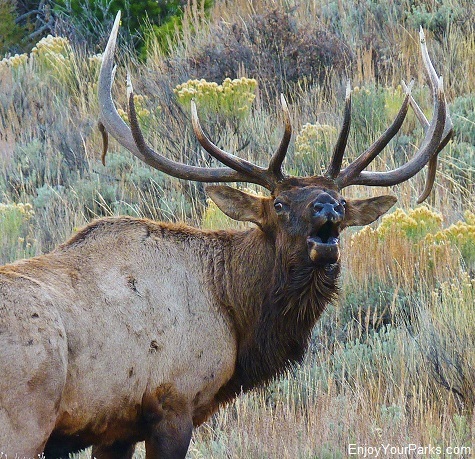 Few things are more breathtaking than hearing a bull elk bugle! 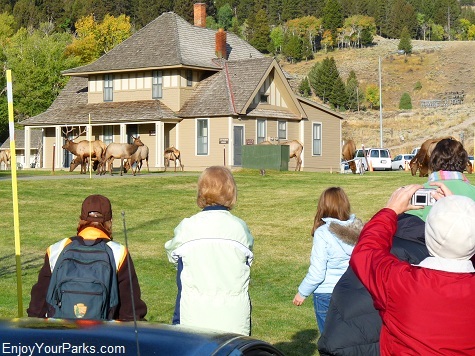 If you come to Mammoth Hot Springs during the fall rut in Yellowstone National Park, you'll hear a chorus of bugling elk! 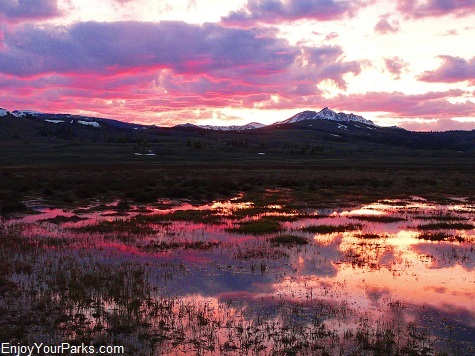 We have enjoyed some of the most gorgeous sunsets we've ever seen on Swan Lake Flats, such as the one in this photo.